This add-on is a work-in-progress. This means you should expect that it may not work, and you should be unsurprised if it does not progress. Disclaimer aside, this add-on is widely used and it usually works just fine. Maintainers are the people who you should complain to if there is something wrong. Forum Private Messages are given a low priority. We might forget! Reddit Posts and PMs are the lowest priority. We often lurk and don't login! If you submit a well-reasoned pull request, you may even trigger a new release! As of August 2014, the vast majority of code is damny's and DMagic's; and technogeeky and is slowly helping out here and there. For licensing information, please see the included LICENSE.txt file. Source Code is available, as some licenses may require. It allows you to scan planetary bodies for terrain, biome, and resource information and generate various kinds of maps. 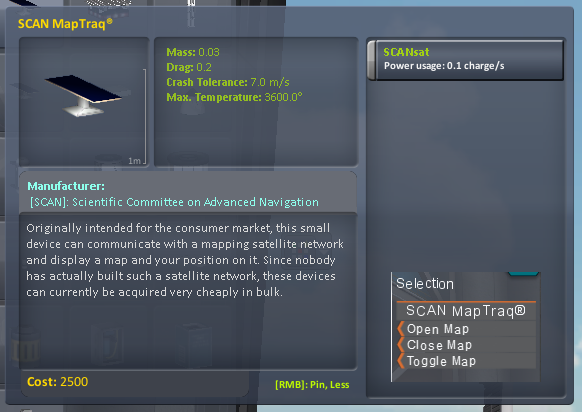 How does SCANsat affect gameplay? Will this version break my existing scans from older versions of SCANsat? No! This version is completely backwards compatible, and you current scanning state (which is stored in persistent.sfs) will be safe and sound. Nevertheless, you should make a backup copy of your game before upgading any mod. Do I need to attach a part to my vessel to use SCANsat? No, but.... You can view existing maps from any vessel, but you need to attach a scanner to add new data to the maps. What does the "field of view" mean? 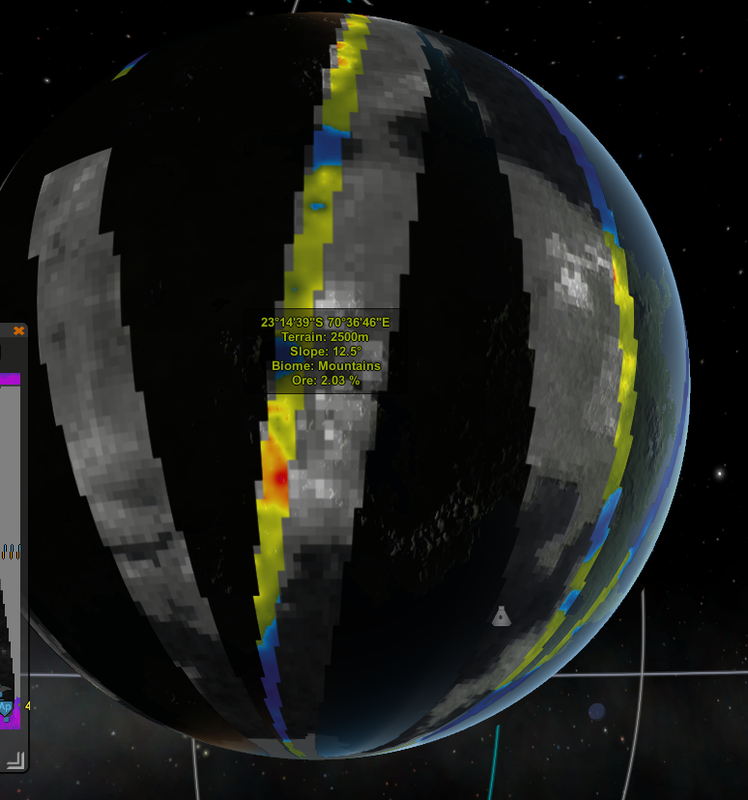 When a sensor is at or above its "best" altitude (but below its maximum altitude) the field of view is half of the width of the swath mapped by the instrument, if it were in orbit around Kerbin. In other words, a field of view of 5° would map swathes which are 1/36th (10°) of the planetary surface wide. The field of view is scaled for smaller bodies so that more of the surface is covered. What does the "best" altitude mean? At or above the best altitude, the sensor will operate with its listed field of view. Below this altitude the sensor suffers a linear penalty. A 10° FOV instrument with a best altitude of 500km would only have a 5° FOV at 250km. 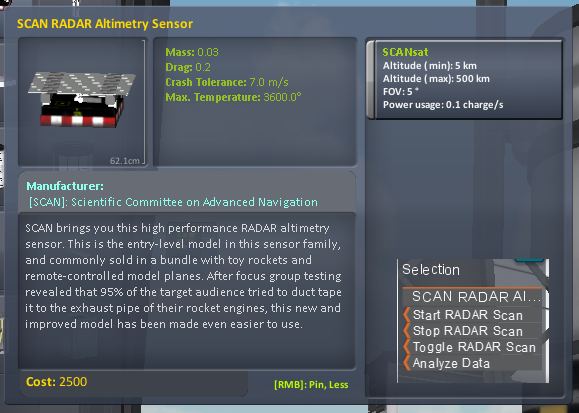 [Career Mode] Does SCANsat give us science points? Yes! For each type of map, if you scan at least 30% of the surface, you can transmit that Data for partial science points; up until the maximum value at 95% map coverage. [Career Mode] Is it integrated into the tech tree? Yes! This link tells you which nodes unlock which parts in the tech tree. 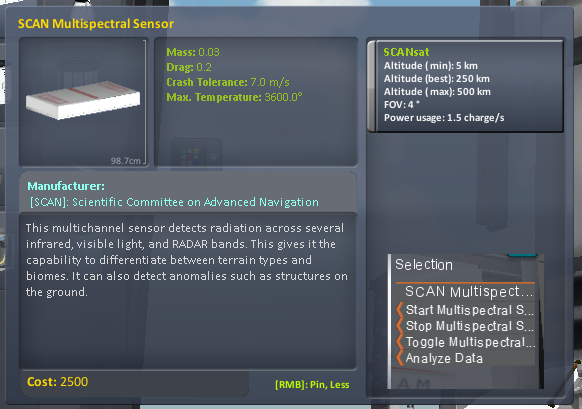 [Contracts] Does SCANsat offer contracts to complete? Yes/No. Contracts are currently only supported through [third-party addons][6d]. Can you add to SCANsat? Probably! First, check the issues page to see if it's already been requested. If not, add a new issue. Even better, attempt to add the feature yourself and submit a pull request. We'll catch the bugs for you! 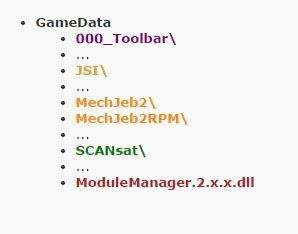 Extract the included package and put the SCANsat folder in your KSP installation's GameData folder. S.C.A.N. 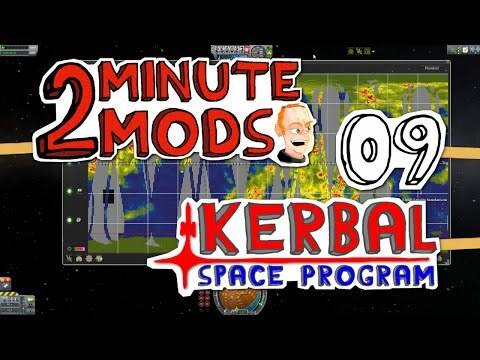 is proud to collaborate with other KSP mods and modding teams. Following is a table of all of the mods, add-ons, or software that we interoperate with. MM, RPM, MechJeb, and Toolbar are all soft dependencies. This means your experience with SCANsat will be enhanced if you are using these mods, but they are not necessary. SCANsat supports several different kinds of scans (as opposed to scanning modules or parts). Resource: Scan for chemical or mineral resource on the surface. Other parts and add-ons are free to include one or more of these kinds of scans. In general, we would request that similar (same order of magnitude) scanning parameters and limitations are used on custom parts, but this is not a requirement. The Slope map is generated from either HI or LO data. The Biome scan only works for bodies that have biomes. 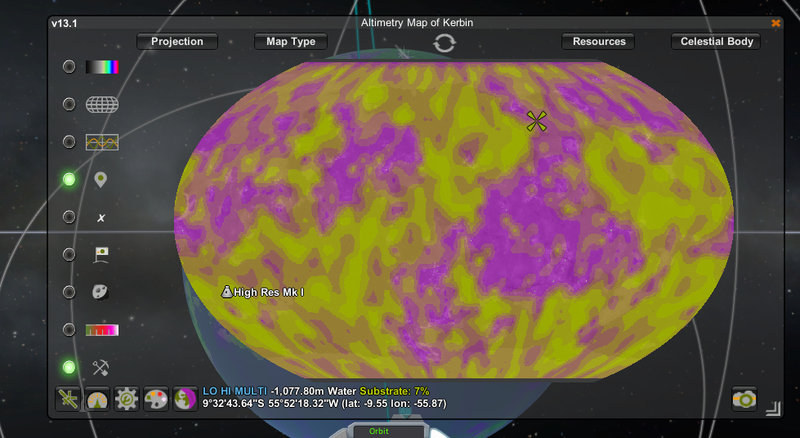 For vanilla KSP, this means all planets except the sun and Jool. 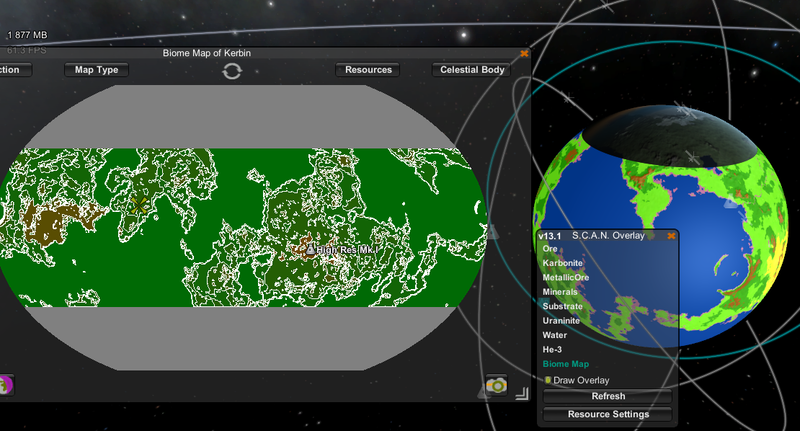 SCANsat will scan celestial bodies for resources using the new stock resource system. For a full description of both stack and SCANsat resource scanning methods check out the SCANsat wiki. With default resource scanning options enabled the SCANsat resource map will automatically update as soon as a stock resource scan is completed. No further resource scanning is necessary while using stock scanning mode. Resource scans are initiated in the same way as any other scan. In this case they use the stock M700 Orbital Survey Scanner. Resource scanning proceeds the same way as standard SCANsat scanning instruments do. The grey scale color option generally works best when viewing resource overlays. 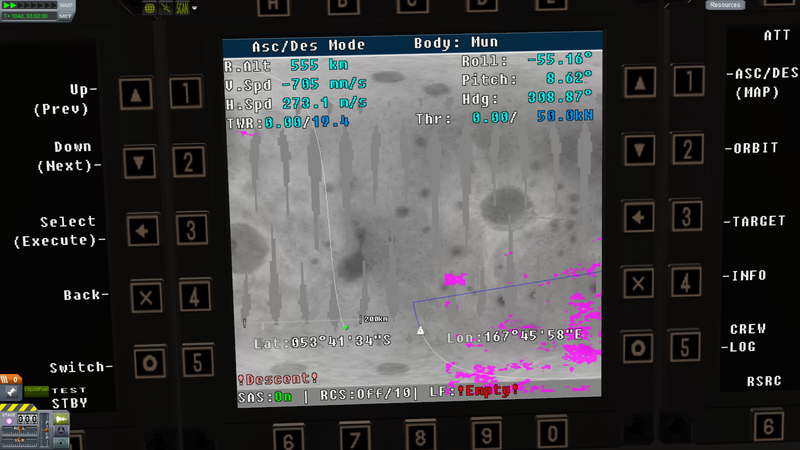 The M700 Orbital Survey Scanner provides a low-detail resource map for all available surface resources. For high detail maps a specific scanner is needed for each different resource. For stock Ore the M4435 Narrow-Band Scanner is used; high detail scanner modules are added to other parts for addon resources as needed. 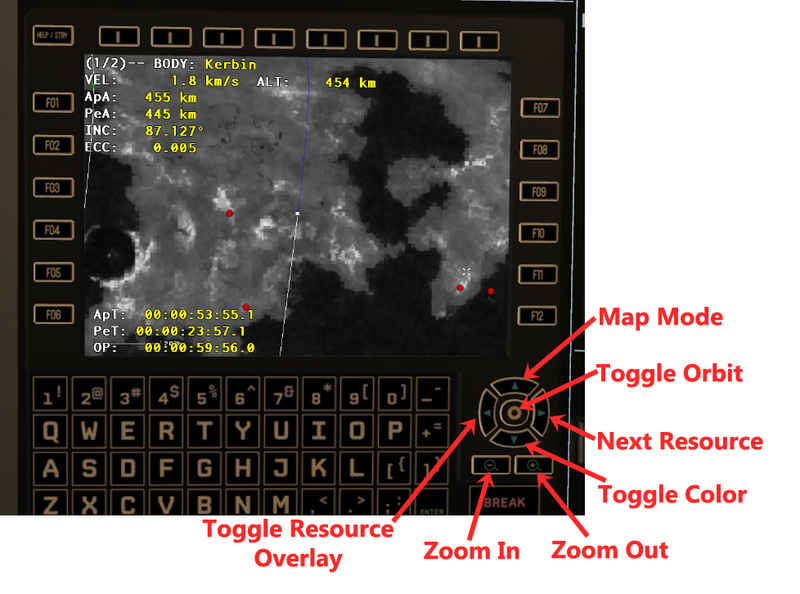 Zoom map resource overlays require that a vessel with a narrow-band scanner be present in orbit and at an inclination high enough to cover the area in the zoom map. 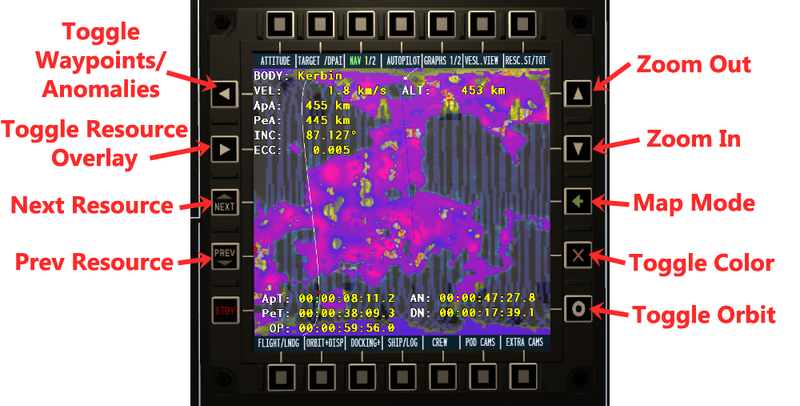 If a vessel with a narrow-band scanner is not present, or its inclination is not high enough, the zoom map will not display the resource overlay. The same restrictions apply to overlay tooltips and the instrument window resource readout. 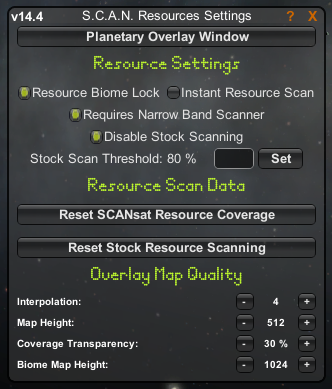 A number of options are available in the Resource Settings Menu for SCANsat resource scanning; this window has an in-game help function activated by selecting the ? icon in the top-right corner. Put scanner part on rocket, aim rocket at sky, launch. If your rocket is not pointing at the sky, you are probably not going to map today, because most sensors only work above 5 km. You can start scanning by selecting a SCANsat part's context menu, enabling the part. Here, you will find a small map. Watch the data indicators on the small map to determine how well your scanners are performing. The right-click context menus also contain indicators for the proper scanning altitude. In these examples, the SAR and Multi sensors are not very well matched. Because the SAR sensors is ideal above 750km, and becuase it has a large field of view penalty if it's down near the ideal for Multi (250km), these sensors probably should not be used on the same scanner. 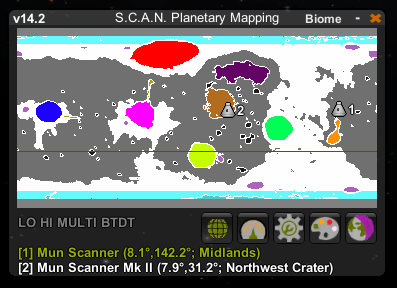 The mapping interface consists of a small-ish map of the planet, as far as it has been scanned in your current game. It scans and updates quickly and shows positions of the active vessel, as well as other scanning vessels in orbit around the same planet. Orbital information is also provided. For a slower but more detailed view, see the big map. Note that the indicators flash blue when the gray-scale color option is selected on the big map. Static! Oh no, adjust the rabbit ears! 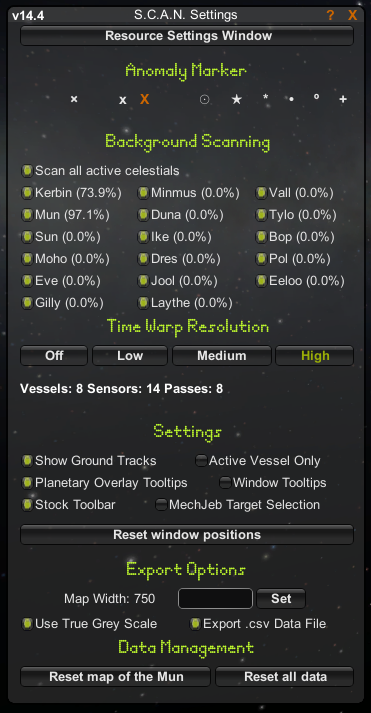 When activated in the settings menu, ground track indicators are drawn for vessels around the current planet. A bigger map can be rendered on demand. Rendered maps are automatically saved to GameData/SCANsat/PluginData. Note that position indicators for vessels or anomalies are not visible on exported images (but they may be a future release). You can mouse over the big map to see what sensors have data for the location, as well as terrain elevation, and other details. Right-clicking on the big map shows a magnified view around the position where you clicked. Mouse operations work inside this magnified view just like they work outside, meaning the data displayed at the bottom window applies to your position inside the magnified view, and right-clicking inside it will increase magnification. This can be useful to find landing spots which won't kill your kerbals. The icon in the center of the upper row regenerates the map. The toggle icons along the left side of the map control the various overlays and the color mode. The four buttons in the bottom-left open and close the other SCANsat windows. The camera icon in the lower-right exports a copy of the map. The re-size icon in the lower-right corner can be dragged to re-size the map. 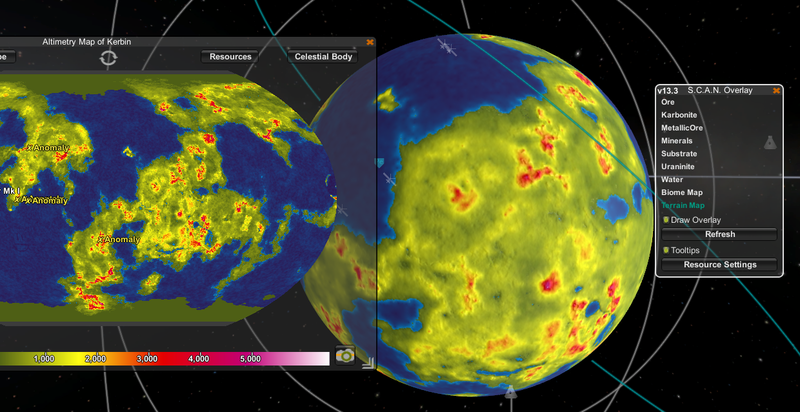 A separate window is used to control planetary overlay maps. 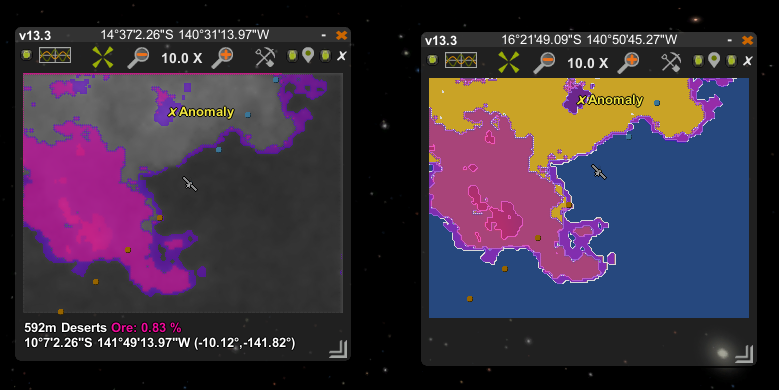 These maps are drawn directly over the surface of the current planet; they use the same system as the stock resource overlays and will replace those maps if both are opened at the same time. Map coverage is dependent upon SCANsat data; only scanned areas will be displayed on the map. SCANsat terrain maps can be displayed with the overlay window. These maps use the same height map data as the small SCANsat map and generate very quickly. Tooltips can be activated to show data for the location under the current mouse position while in map mode. SCANsat biome coverage can also be displayed using the overlay window. 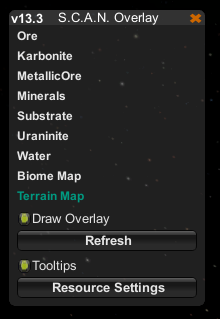 Each available resource can be selected for the planetary overlay maps, along with biome maps and terrain maps. Biome maps are currently limited to the stock color scheme without borders. A separate, small map can be opened from the big map by right-clicking somewhere within the big map. This new window will be centered on the mouse cursor's location and zoomed in by a factor of 10. Icons on the zoom map can be used to zoom in or out, to a minimum of 2X zoom. The terrain coloring limits will are modified to use the local minimum and maximum terrain height within the zoom map's field of view; the full color spectrum will always be used in zoom maps. The zoom scale and map center can be controlled by clicking within the zoom map. Left-click to zoom out and re-center the map at the mouse cursor. Right-click to zoom in and re-center the map at the mouse cursor. Middle-click or Modifier Key (usually Alt on Windows) + Right-click will re-center the map without changing the scale. 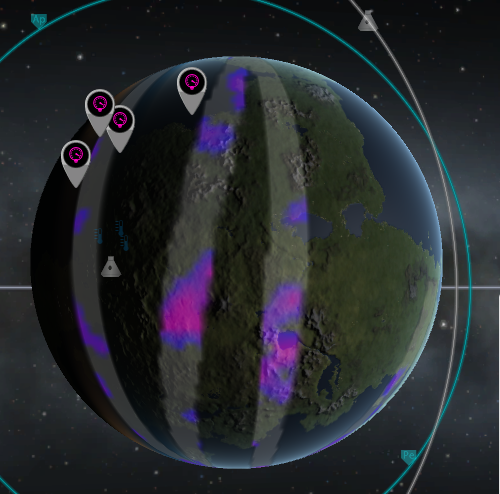 The vessel orbit overlay, waypoint icons, and anomaly locations can be toggle on and off independently of the big map settings. The zoom map also features mouse-over information for the cursor location similar to that shown on the big map. Different map types, resource overlays and polar projections are all applied to the zoom map as well. Parts with the stock ModuleHiDefCamera (i.e. the Narrow-Band Scanner) have a special SCANsat module that opens a modified zoom map. 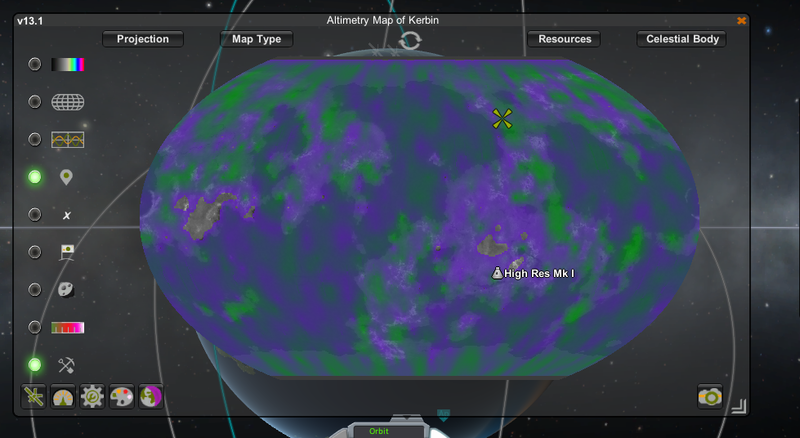 The zoom map features an option to select and display a target site for each planet. Toggle Target Selection Mode by clicking on the target icon in the upper left, then select a sight in the zoom map window. The icon will be displayed, along with standard, FinePrint waypoints, in the zoom window and the big map. While in map view the target site will be overlayed on the planet's surface; shown as a matching, four-arrow green icon. To clear an existing target, activate Target Selection Mode by clicking the target icon, then click somewhere inside of the zoom map window, but outside of the map itself. The zoom map can be used in the same way described above to select a landing site for MechJeb's Landing Guidance module. The current vessel must have a MechJeb core and the MechJeb Landing Guidance module must be unlocked in the R&D Center. Landing sites selected through MechJeb will automatically show up as a waypoint on SCANsat maps. The instruments window provides a readout of several types of data based on current scanning coverage. SCANsat includes support for IVA maps through Raster Prop Monitor. Standard RPM multi-function displays and those using the ASET props are supported. The RADAR Altimetry sensor can be unlocked in Basic Science. The SAR Altimetry sensor can be unlocked in Advanced Science Tech. The Multispectral sensor can be unlocked in Advanced Exploration. The BTDT sensor can be unlocked in Field Science. Between 30% and 100%, you will get a number of science points proportional to the percentage. Really, the upper cutoff is 95% in case you didn't scan the whole map. Career mode contracts are supported through third party addons. SCANsat includes Contract Configurator contracts for scanning each planet. 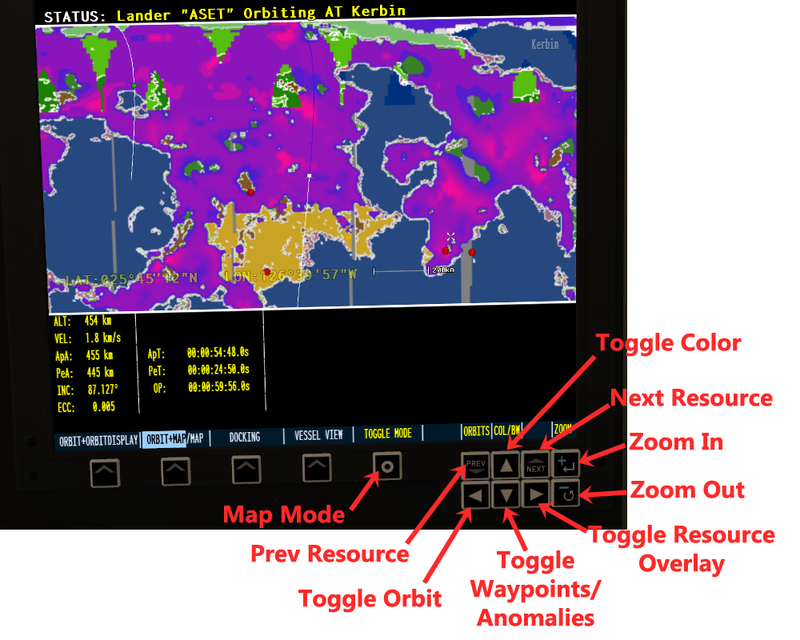 SCANsat provides multiple options for map color configurations and terrain level changes; this window has an in-game help function activated by selecting the ? icon in the top-right corner. The color management window can be accessed from the big or small map with the color palette icon, or from the toolbar menu. On the left are the various color palettes available; there are four different styles that can be selected from the drop down menu. Palettes can be customized by changing the number of colors in the palette, reversing the order, or making the palette use discrete color transitions, rather than the smooth gradient used by default. Changes to the color palette are reflected after selecting Apply, the big and small maps will automatically refresh using the newly selected color palette. Note that only the altimetry map is affected by color palette selection. There are several terrain height options available as well. The Min and Max height sliders can be used to set the lower and upper cutoff values for the terrain height-to-color algorithm. 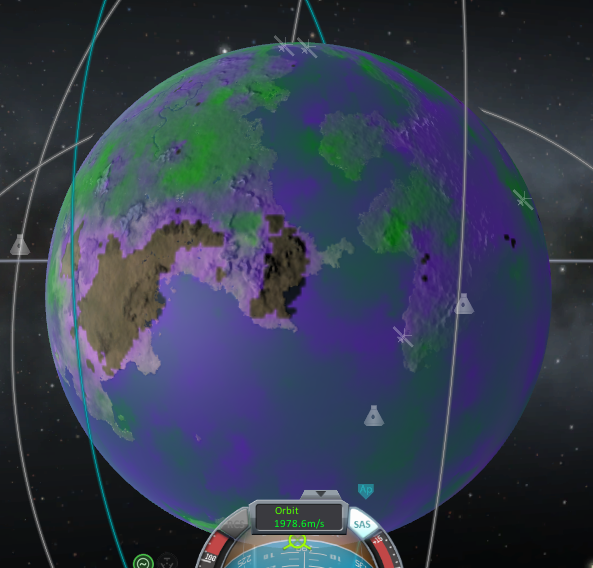 All stock KSP planets have default color palette and terrain height values appropriate for the planet's terrain. Standard default values are used for any addon planets. 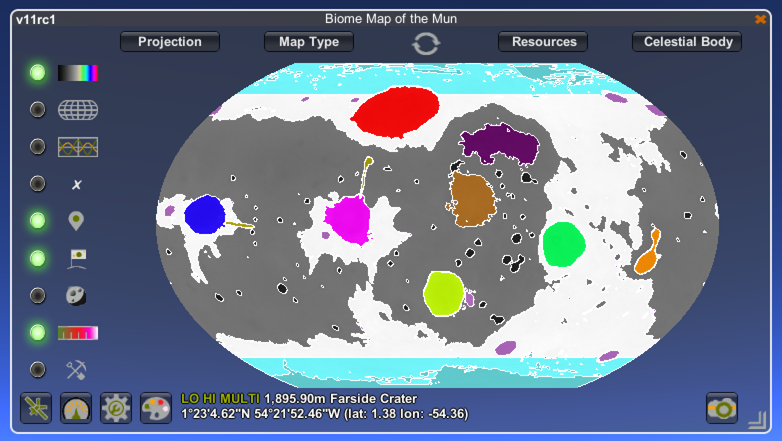 Biomes can also be displayed using the stock color maps. Unlike some other KSP scanning systems, SCANsat allows scanning with multiple vessels. All online scanners scan at the same time during any scene where time progresses; no active SCANsat parts are necessary. SCANsat does not interpolate satellite paths during time warp; nevertheless, due to the relatively large field of view of each sensor, it's still possible to acquire data faster by time warping. The maximum recommended time warp speed is currently 10,000x. Scanning at this warp factor should allow identical scanning performance (in terms of swath width) as scanning at 1x. Notice that the only gaps in coverage are those at the poles (ie, the selected inclination was not high enough to capture the poles). The settings menu has a various general options; this window has an in-game help function activated by selecting the ? icon in the top-right corner. Time Warp Resolution affects the scanning frequency of background scanning. Decreasing this value may result in gaps in maps while scanning at high time warp, but may alleviate some performance issues. Sensors: The total number of SCANsat sensors on all vessels; note that all combination sensors are separated into their invidual components, i.e. the Multi-Spectral scanner consists of two sensors, Biomes and Anomalies. Passes: The number of scanning passes recorded per second, this number can easily be in the tens of thousands at high time warp with multiple vessels and sensors active. 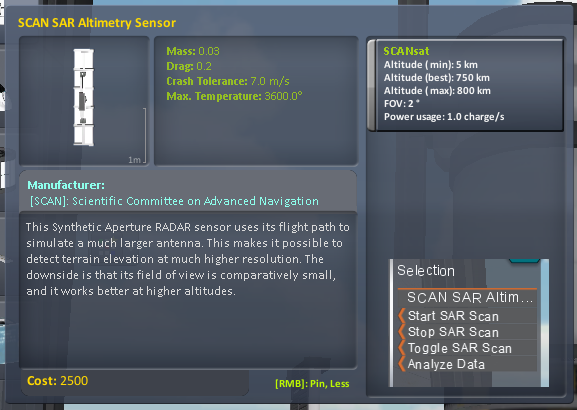 SCANsat can't guarantee that all anomalies will be found; in particular, some are so close to others that they don't show up on their own, and if the developers want to be sneaky then they can of course be sneaky. I have the same issue, I launched a satellite into minmus orbit and the parts don't deploy, I reinstalled the mod but still nothing. Hi, I have an small issue with this Mod. I really dont know why it does this, but I installed it twice, and the parts simply dont work. 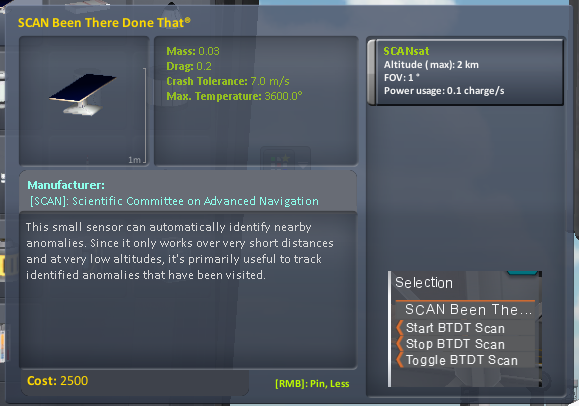 What I mean is that I get the parts, the computer, but the scanning antenna's wont extend, even if i'm in a polar orbit. Anyone knows why it is so? great! very pleased, yay!!! update to 1.1!!! many tanx ! Great mod. One issue I'm having though - exiting the big map while piloting the craft makes the status dialogues for everything with a battery pop up (as if you had right clicked on them all). No matter what I do I can't close them. Alright, im new to this sort of thing! So help me out here, obviously you guys know how to do this. Ive had ksp for a while and i love it, but sadly i know next to nothing when it comes to the technical side of computers. So if anyone would be willing please tell me step by step how to get this mod :D THANKS! its just so nice and logical - sending an unmanned probe to take topological scans to work out where to land my first kerballed missions ^^ <3 for the mod dude, keep it up! Just downloaded the Scansat. It seems to work great except one annoying thing. When you go to to the Polar map the program does not allow you to back out of that view. I am running 1.04. This is a HUGE dissappointment cause everything works pretty cool and looks cooler. But nothing is WORSE than a screen locking up in your game and you cant get out of it. I will have to uninstall this until I know whats going on as it ruins the game. i like this mod. worth the download.